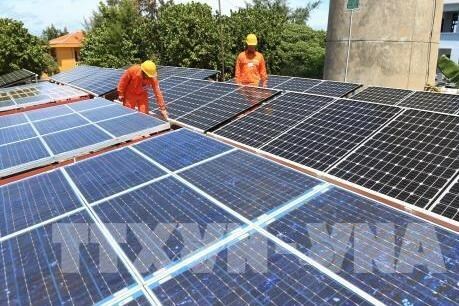 Hanoi (VNA) – The People’s Committee in the south central coastal province of Ninh Thuan has approved the building of the 35-MWp Nhon Hai Solar Farm. The plant, which has been invested in by Licogi 16 JSC at an estimated cost of 854 billion VND (36.7 million USD), will span 42 ha. Its construction is scheduled to begin in July this year and be completed within 24 months. As planned, the solar farm will be fully operational in January 2021. Recently, the Government issued Resolution No.115/NQ-CP dated August 31, 2018 on special mechanisms and policies to facilitate Ninh Thuan’s socio-economic development for the 2018-2023 period. Accordingly, the Government approved a plan to turn the province into one of the national renewable energy hubs. Ninh Thuan is hoping to attract wind and solar power projects with total respective capacities of 1,429 MW and 3,912 MW by 2030. To realise this goal, the province is promoting investment attraction and creating the best possible conditions for investors.